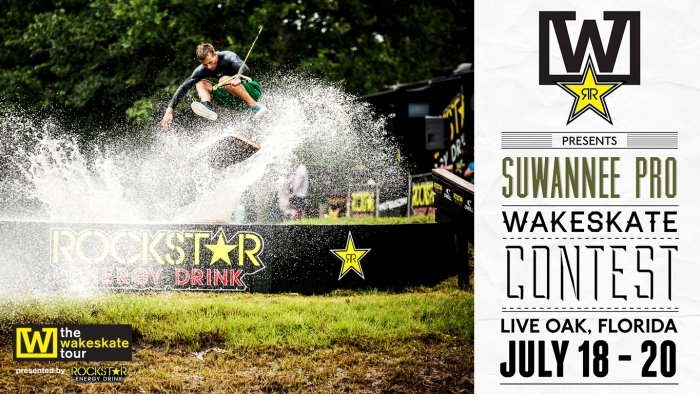 Suwannee Pro - Stop #3 of The Rockstar Wakeskate Tour will take place in Lake City, FL less than a week away on July 18-20th. We invite fans, spectators, and athletes alike to join us for what is sure to be a showdown. Rockstar athlete Nick Taylor is host to stop #3 and this weekend will truly be the christening for his property. The site will be the biggest wakeskate compound in wakeskate history. The world's best will be on hand to battle it out for a $10,000 prize purse. The leaders will be battling for the top seed which is currently held by our youngest competitor, Daniel Grant. With two stops left it's still anyone's game. There are 10 spots left for qualifiers, but please act quick as the deadline for regular registration ends at 12am EST July 13th.